First Name: Dr. Georg von Tiesenhausen, Jr.
Last Name: Dr. Georg von Tiesenhausen, Jr. I do not know whom I am addressing, but I just had to express my deep admiration for the marvelous history of Gurley that I just read--with all of the wonderful photos and old documents. I came across the link quite by accident, and was so engrossed in the fascinating history, that I stayed on the computer for about 5 hours now, reading every line and looking at every photo entry. The research that you did is phenomenal in scope, and the interesting manner in which you wrote the material is quite captivating. Congratulations on such a fantastic job, and thank you for sharing your history. I have been enjoying all of the history of Gurley Alabama and the people associated with it, and was wondering if you could provide me with any information other than that found in your site for Elijah F. Walker and James Monroe Mason. Elijah F. Walker was a Captain in the Eighth Missouri Cavalry Regiment commanding Company E, and after being paroled on June 7 1865 he went back to Gurley Alabama after serving in that area during the War Between the States, and he got married and raised a family there. I would like to know if there are any members of his family still alive in Gurley, or elsewhere. I am writing a History of the Eighth Missouri Cavalry Regiment as a present for my son who is a First Lieutenant in the U.S. Army. My second great grandfather, Joseph Guild Lewis was a Lieutenant in Company B of the Eighth Missouri Cavalry and my son is a Confederate Re-en-actor while serving in the U.S. Army. James Monroe Mason may be related to my Mason family, as William Isaac Mason and Elizabeth Henson were married in Alabama in Cherokee. Their son James B. Mason married Marinda Bell Pirtle and one of their daughters was Katie Cordelia Mason who married Simeon English Lewis. Simeon and Katie were my grandparents. I would appreciate any information that you could provide on Elijah F. Walker and James Monroe Mason, including any living descendants of either of these two men. I really enjoyed reading through your website and congratulate you all for preserving the history of your town so well. I hope you carry on your good work so as to insure that Gurley will be known many, many years to come. One of the main characters is Captain Elijah Walker, my great grandfather prominently mentioned in the Gurley website historical section. The novel is currently in the hands of a publisher and the book is expected to be released sometime this year. The folks of Gurley will have a special interest my second sequel novel titled CUZCO. The same characters are used and Chapter one starts out in Gurley with familiar landmarks. I will keep you and your readers posted on release dates and any other useful information. The novels are written under my pen name Alex Walker and a website will soon be developed.. Please feel free to publish this on the Gurley website if you wish. Hi, You have a nice web site concerning Gurley. My name is Randy Chambers and I'm trying to find out more about the William J. Chambers that died in Gurley in 1905. He was born in TN in 1837 and uses many of the same names found in my family. William's father was James C. Chambers. My gggf was a James C. Chambers who had a brother named William J. Chambers. My gggf named one of his children John I, as did William J. I would appreciate any information concerning this family. The census also list Mayville as where William J. lived and I understand it is also in Madison County. Gurley Historical Association, Inc works to get historic City Hall Preserved before it is destroyed. The links to vote are http://www.preservationnation.org/take-action/this-place-matters/community-challenge and http://www.preservationnation.org/map. I’m trying to reach Donna White Parker she is the daughter of Ruby Nell Hollingsworth White. She is married to Kenny Parker and has two sons Nathan and Nick. I have been praying for many years to find them you see I’m Nathan and Nicks biological Mom my name is Kimberley Lynn Cheeseman Weeks. The boys last names was Noble until after the adoption took place. I want to make sure they are safe and healthy I pray every day for them. I love them very much not a day has passed that I don’t think of them. I want to inform them about possible health problems that I have learned about their biological father and his family that is very serious. And if they are having any kind of medical problems I have information that could be of help. I had three boys after Nathan and Nick Joshua 13, Thomas12 and Jonnathan is 11 they know about Nate and Nick and pray for them also. I’m a single Mom raising my boys who would love to meet them I pray that you can help me. Pass on my information to the family my address is Kimberley Weeks 734 Nolder Drive Lancaster Ohio 43130. I would love to talk with Donna she can call me 614-937-8496 my cell she can email me. Nathan and Nick have a special place in my heart and I’m praying to God that the Holly Ghost will lead the way. I trust in God and I have faith thank you for all your help. The Gurley Meth Forum will be at 7:00 p.m. on August 24 at the Madison County Elementary School auditorium. The program will feature a panel from law enforcement, treatment, recovery, and other areas. The program is being arranged by the Southeast Madison County Coalition to Reduce Illegal Drugs, the Partnership for a Drug Free Community, and Gurley Cumberland Presbyterian Church. This is for all people in the Gurley area. There will also be a similar forums in New Hope and Owens Cross Roads. For more information, contact the Partnership for a Drug Free Community office at 256-539-7339. Ed Soule, Gurley Lions club and Chestnut Grove United Methodist Church. Thanks for posting the pictures of Alabama folks. I can identify those labeled Spivey. I’m working on my step-father’s family tree and his ancestors are Spivey. Frederick Spivey immigrated to the US from England and ended up in Madison County AL. His son, Reuben M. Spivey, after serving in the confederate army, left Alabama after the Civil War and ended up in Kansas, where he married Lina Owens . They had several children: Reuben, Albert, and Marcia. Frederick’s other children included Robert and Elizabeth (Ellen), who most likely stayed in AL. You’ve posted pictures of Lina Spivey, Reuben Spivey, Ellie, Reuben Jr,, Marcia, and Albert on your website. We have a large portrait painted of Lina, but no photograph, and our portrait of Reuben has been lost. I’m not sure why the pictures ended up in Alabama since they almost all lived in KS, unless the pictures had been sent back to Reuben’s family. From the records, it appears that the parents of Reuben Spivey died before 1860 and the children moved in with their mother’s family. I had thought this name was “Brown”, but in other censuses I see McBrown and McBroom. Hannah appears to be the oldest in this family. Thanks so much for sharing! Please let me know if you’d like more specific information. The admission, music, and general events are free to the public; food and crafts and more will be available for purchase. The event is at Charles Stone Park on Walker Street in Gurley, which is about 16 miles NE of Huntsville. Walker Street runs parallel to Highway 72 East, so you turn off the highway on Gurley Pike or First Street which will intersect with Walker Street. The park is behind the Piggly Wiggly located on the highway, and close to the Library and City Hall on Walker Street. At the festival, check at the Gurley Historical Association/Town of Gurley Booth for information on all activities – details listed below for your info. Contact 776-3313, x10, Gurley Town Hall, or visit http://gurleyalabama.contactez.net for more info. What: "Celebrating Our Past" Festival and Music When: May 7 and 8, 2010 Friday, 5/7 Gates open at 5:00 p.m. to 10P.M. Saturday, 5/8 Gates open at 10:00 a.m. to 10:00 p.m.
Why: Celebrating "2010: The Year of Alabama Small Towns/Downtowns"
Admission, music, and general events are free to attendees. Food, crafts, souvenir items, etc., available for purchase. Bethel University Renaissance Bluegrass Group 4-6 p.m.
Rollin' in the Hay 8-10 p.m.
Live Music Entertainment 6-10 p.m.
Live Music Entertainment 4:00 - 10:00 p.m. Cemetery Stroll 2:00 – 3:30 p.m.
It’s “The Great Alabama Homecoming” and even the “spirits” are coming back to Gurley, AL to celebrate “2010: The Year of Alabama Small Towns/Downtowns”. The Gurley Cemetery is a large urban cemetery which “sits on a knoll overlooking a spot of ancient charm that once was the location of the Gurley Baseball Field”. It was established in 1880, and contains more than 1000 markers, including Veterans of all U.S. Wars and 52 Confederate Soldiers. Come see and hear these costumed characters and many more of Gurley’s storied citizens including The Circuit Rider Preacher, The Cat Lady, and The Professional Baseball Player, come back to life. Also enjoy a self-guided tour of over 20 species of mature trees scattered throughout the cemetery while listening to the auto-harp/bass music of by-gone days. The Cumberland Presbyterians are celebrating the 200th Birthday of their Denomination this year, along with their contributions to educational and religious development in the Gurley and North Alabama area. Private, preparatory Robert Donnell High School and two-year college, located in Gurley in 1894, was named after the prominent CP itinerate minister. In 1908 it was donated to the state of Alabama by the CP’s, to become Madison County High School - the first public high school in Madison County ; and it is still in operation today. Robert Donnell also established a school in Athens, AL, and was instrumental in founding Cumberland University in Lebanon, TN. His home in Athens, The Donnell House, was spared destruction during Union occupation and has undergone restoration. Members of the Robert Donnell Presbytery will participate in the Gurley “Celebrating Our Past” Parade on Saturday, May 8, as part of the “2010: Year of Alabama Small Towns/Downtowns” Festival and Music event. Robert Donnell, in costume, will be circuit riding on his horse as “camp meeting” singers join him enroute to a service. The CP Bethel University Bluegrass Band from McKenzie , TN , will be performing in the parade at 10:00 a.m. in Gurley’s Historic District; again from 4:00 to 6:00 p.m. at Charles Stone Park ; and at the Gurley CP Church on Sunday, May 9, at 9:00 a.m. Admission is free, and everyone is invited to join the celebration. More info at http://gurleyalabama.contactez.net or call 256-776-3313. You are invited to attend a free concert "Arise My Love" - The Tour by Bethel University Renaissance troupe. The troupe performs a wide range of musical styles -- bluegrass to jazz, show tunes to "doo-wop" and the best-loved songs of faith, both traditional and contemporary. The Gurley Public Library will be having a Christmas Party on December 17th from 3:30 – 5:00 pm. For ages 1 – 92! Come enjoy books read by the librarians, crafts, refreshments, and a showing of The Grinch! The Historic Gurley Association and the City of Gurley invite everyone to join together and celebrate the beauty and joy, sights, sounds, and memories this season brings. Get in the spirit! Decorate your home! Win a $100 1st , $50 2nd, or $25 3rd prize. quilt; and by donating new mittens, hats, jackets for MCES K-8 students. Bar-B-Q Meals @ Methodist Church Starting at 1:00 p.m.
Christmas Market @ Methodist Church 2:00 p.m. – 6:00 p.m.
Choral/Brass/Piano/Organ Selections 3:00 p.m. - 5:00 p.m.
Caroling – Methodist and CME Choirs 5:00 p.m.
Rick Angel – “By Grace” Trio 7:00 p.m.
First Baptist Church 4:00 p.m. - 7:00 p.m.
Placement by Gurley Study Club 6:00 p.m.
First Baptist Church – Cookies and Hot Chocolate/Cider 3:00 p.m.- 6:00 p.m.
Luminaries 5:00 p.m.- 9:00 p.m.
MCHS FFA Members helping to prepare and deliver luminaries. For information Call 776-9218 or 776-3670. We have finalized our plans for the December 20th event. Major changes being that the carriage rides are free and time has been extended to the date for house decoration judging; and Military wreath placement time. MCHS presents Back to the 80s Friday, December 4th and Saturday, December 5th at 7:00pm in the Madison County Elementary School Auditorium. Tickets can be purchased from any cast member, Mrs. Prestridge, Ms. Stacy Johnson, or the Madison County Elementary office for $7.00. Tickets the night of the performance can be purchased at the door for $8.00. The Historic Gurley Association and the City of Gurley invite everyone to join together and celebrate the beauty and joy, sights, sounds and memories this season brings. Get in the spirit! Decorate your home! Win a $100 1st, $50 2nd, $25 3rd prize. Have a barbeque snack, browse the gift market, relax to music, take a carriage ride, remember our military, and enjoy the decorations and sparkles of Gurley’s Historic District by candlelight. Brass ensemble and Piano/Organ Selection – 3:00 p.m.
Rick Angel - “By Grace” Trio – 7:00 p.m.
First Baptist Church 4:00 p.m. – 6:00 p.m.
First Baptist Church 3:00 p.m. – 6:00 p.m.
Luminaries 5:00 p.m. – 9:00 p.m.
the Gurley Historical Society will be having a "Reformation" meeting this Sunday November 15 at 2:00 at the City Hall. They will be trying to "renew" and "restart" an interest in historical Gurley and will be electing new officers and such. GIRL SCOUT TROOP 678 is active again! We will meet every other Wednesday from 2:45 – 4:30 in the MCES Cafeteria. Students may then ride the Gurley Community Learning Center School Bus Home!!! Or Parents may pick their daughter(s) up from the school by 5:30. To sign your daughter(s) up contact Jeanine Woods. The 1st Girl Scout Meeting will be Wednesday, August 26! NEEDED: Parents to help at meetings, be drivers, and help in other areas. The reception will be held at the Gurley Public Library on August 30, 2009 from 2:00 – 4:00 pm. Blake Dorning, Sheriff, Madison Co.
Gina Koger, Mental Health Center of Madison Co. Seating is limited. Please call 256-539-7339 for reservations. This is an important topic to all of us and the the decisions they make will affect us here for many, many years. The DOT will host a public meeting on May 21 for the firm, Sain Associates Inc., to present the plans to the public. The meeting at First Baptist Church of Gurley at 175 Joplin St. will be from 5 to 7 p.m. I am glad to hear they plan on traffic signals at Keel Mtn Road and Little Cove Road, but we also need bright streetlights to illuminate our stretch of the highway at night and Gurley City should also plan for service roads on either side of the highway so you don't have to cross it as much, or at all, depending on where you are going. We are on the verge of massive growth. I fully expect Gurley to look like Madison within 15-25 years so they had better get a better traffic plan in place than Madison did. Gurley should plan for limited access to Hwy 72 in the future, perhaps even overpasses and freeway-style traffic interchanges. Memorial Service May 24 at 2 PM Charles Stone Park next to the city hall. Hot Dogs and Drinks Sold. All proceeds from hotdogs and drinks sold will go to the Gurley Food Pantry. Come and honor our veterans. My name is Keith Lipman Klemow-Gurley, I am looking for a male Gurley that may have been from Gurley, AL or Someone that may have know him. This male would have gone to The Ft. Worth, Texas area around 1963. I was conceived around March of 1963 and I was born Dec 17, 1963. I will be 46 in December. I am looking for my Father. My birth mother's name was Sharon Jean Klemow and I believe she may not even have told my father about her being pregnant or me even being born. I am definitely a Gurley, I have done over a dozen DNA tests all linking me to the Gurley Male blood line. In addition I happen to look like a few of the original Descendents and settlers of Gurley, AL, In fact I look very much like the photo of Capt Frank B. Gurley from 1875. Most of the Gurley males do look similar but I really look like this man. If anyone knows of any male Gurley going to or living in The Ft. Worth area in 1963 Please contact me at the info below. In June a group of individuals from our church will be undertaking a mission trip to the Cumberland Presbyterian Children’s Home in Denton Texas (www.cpch.org). This is the first mission trip we have planned on our own, and 17 individuals have signed up so far to make the historic trip. While at the Children’s Home these individuals will be providing whatever support is needed as an outreach ministry of our church. The estimated cost of this trip is approximately $5,200. This is a large amount of money, and the mission trip team will be working hard over the next several months to raise money to help fund their trip. Please prayerfully consider your role in supporting this outreach ministry. THANK-YOU in advance for your support of this ministry of the church. If you would prefer to just make a donation you may do so by sending your funds directly to the church and indicating they are for the Mission Trip. All monies raised will go solely for funding the Mission Trip! Visit our website at www.contactez.net/cp for more information or visit us on YOUTUBE or check our FACEBOOK profile. To contact Toy replace NO@SPAM by @ in his email address. I am researching my family. George and Lydia Carpenter had Gurleysville listed as their post office on the 1870 census. I have a picture of them. Lydia was related to the sharps of Madison County. They had two children born in 1868 and 1871. The children went to live with the Sharps when they were little and Lydia must have died and we don’t know where George went. We think back to Tennessee. I hope to come to your town this spring and research a little more. To contact Karol remove NOSPAM in the email address. MCHS presents Bye Bye Birdie Friday, December 5th and Saturday, December 6th at 7:00pm in the Madison County Elementary School Auditorium. The Sons of Confederate Veterans is planning a ceremony to honor Confederate veterans buried in Gurley Cemetery. We'd like to invite the Gurley Historical Society to join us. In fact, we'd like to offer an opportunity for one of your members to speak at the ceremony. If you have a prepared talk about Captain Gurley or any other of the interned Confederate Veterans, we'd love to feature that as the keynote. You just might be honoring your own ancestor! The Sons of Confederate Veterans will host a ceremony to honor Confederate veterans buried in Gurley cemetery. The ceremony will take place on December 13 at noon. Huntsville's SCV has marked the grave of every known Confederate veteran in Madison County. Gurley cemetery has 54 veterans. Please pass the invite along to whomever you believe would be interested in attending. I would like to submit – http://www.thecolor.com as a coloring site for your consideration. Thecolor.com is a unique site for online coloring. We have over 1,000 images to color in online without having to print. This is more online coloring pages than any other online coloring site. TheColor.com helps kids learn color concepts, eye-hand coordination, picture comprehension – these skills form the foundation for early learning success. We are COPPA compliant. Everyone can use the site as no java, flash or applet is necessary to load the pages. Kids can email the pictures they colored or save them or print them. I believe that thecolor.com would be a great addition to the list of quality sites you have posted and would be very grateful for a review. If you have any questions feel free to call or email me. Includes chicken, green beans, mashed-potatoes, roll, dessert & drink! Tickets may be purchased from any church member or by calling the church at 776-2331. They are renaming the high way (72 E) from Moores Mill Road to the Jackson County line in his honor - the folks from Montgomery will be here to honor him. They will also undrape the high way sign indicating the high way has been renamed in Albert Hall's honor. There will be refreshments following the ceremony. In case of rain the dedication will be held at the Gurley city hall. Benefit for Parker Allen, the 20 year old son of Stuart Allen, the MCHS boys' basketball coach. The Allens have lived in the Gurley community since 2006. Coach Allen led the MCHS Tigers to the 4-A Boys' State Championship in 2007. Parker was injured in an automobile accident in Auburn where he was a student. He sustained injury to his brain stem, and his recovery is painfully slow. His dedicated parents are lovingly caring for him at home. The goal of this benefit is to raise enough money to help the Allens with many expenses they continue to incur. Let's show our support for this great family! -- $10.00 from 5:00 to 7:00 p.m. on Saturday, October 4, 2008, at the Madison County Elementary School Lunchroom on Wood Street in Gurley. The chicken is being cooked by Mark and Jerry Craig. Following the dinner, there will be a free gospel singing in the MCES auditorium. There will also be silent auctions going on through out the night with items that you won't want to miss. You may donate to the Allen family by sending your contribution to the Gurley Lioness Club (the sponsoring organization) at P.O. Box 61, Gurley, AL 35748. Gurley Community Health Fair - Mark your Calendar! FREE Health Screenings! Are you working and still cannot afford healthcare coverage for your children? Mom and Dad, bring the kids, bring the grandparents, bring the aunts and uncles! All are encouraged to take advantage of the services and screenings available. FREE Smoke Detectors will be distributed! ALLKIDS is a low-cost, comprehensive healthcare coverage program for children and teens under age 19.
http://www.adph.org/allkids or call our toll-free number 1-888-373-Kids (5437). "Changing Lives, One Home at a Time"
To contact Ann replace NO@SPAM by @ in her email address. I am searching for historical information on Gurley and the surrounding area for genealogical purposes. I am researching the family names: Adair, Moon, Ragsdale, McMullen, and Sublett. I was surprised to see so many references to these names in your general area, e.g., Adair's Ford, McMullen road, Moontown, etc., and I am trying to obtain more background. I would appreciate any referral to other Web sites, books, etc., that could help. To contact Nancy, remove NOSPAM from her email address. Tickets maybe purchased from any church member or by calling the church office. All proceed will benefit the Gurley CP Church roof replacement fund. I had the opportunity to meet many of you at last month’s county-wide PAC, and I want to follow up with you. As the tax vote approaches, I wanted to provide you with the single sheet handout that we’ve used while talking to parent groups throughout the county. I have attached both pages of the front and back flyer. If anyone else can get a group of parents together that would like to have me, Dr. Davis or another board member come and discuss the tax, I’d be more than happy to attend. · We are currently 628 students over building capacity county wide. · We are projected to be between 3,500-4,000 over building capacity by 2012, due to inherent growth and the impact of BRAC. · We have $160 Million in needed buildings, additions, and renovations to accommodate those additional students. · He have about $25-30 Million available to us to build with ($130 Million or more short of above need). · This ½ cent sales tax revenue CAN ONLY BE USED FOR NEW BUILDINGS, ADDITIONS, AND RENOVATIONS (or payment on debt for those same things). · This ½ cent sales tax will generate $7.5 Million per year for the county school system, which we can use to borrow about $130 Million. · The City Councils for both Huntsville and Madison have the authority to levy ½ cent sales taxes for their respective school systems, and they are likely to do so if this county-wide tax fails. If that happens, those of us in the county will end up paying the ½ cent sales tax when we shop at Bridge Street, Parkway Place, Wal-Mart, Target, Publix, etc (almost all are inside the city limits), but our kids WON’T GET ANY OF THE BENEFIT! · What if the tax fails? How will be accommodate the extra 3,500 students? 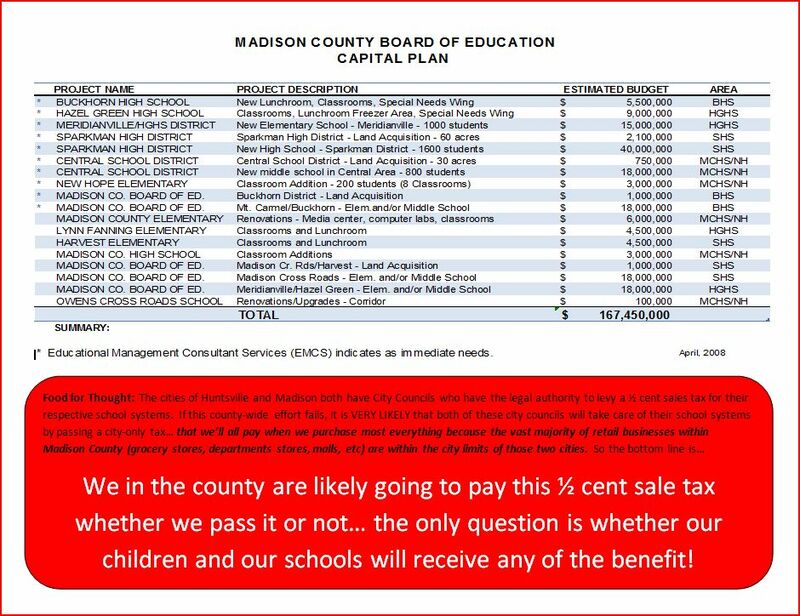 ·In my opinion, it is unlikely that this tax will pass throughout all of Madison County (including both cities), but it doesn’t have to for us to succeed. Because this is an “advisory vote”, the County Commission will use the outcome of this vote to shape their votes, but it’s not directly tied to the outcome of the election. In other words, if we can win in the districts of the predominantly rural commissioners (Roger Jones, Jerry Craig, and Dale Strong) and convince them to support the tax, they can vote in favor of the tax and it can then pass with the help of County Commission Chairman Mike Gillespie (who only votes on ties). We HAVE to have a compelling showing in those three rural commissioner’s areas. I appreciate your support and your hard work on behalf of children. Please forward this to your personal networks with a plea to support this vote. 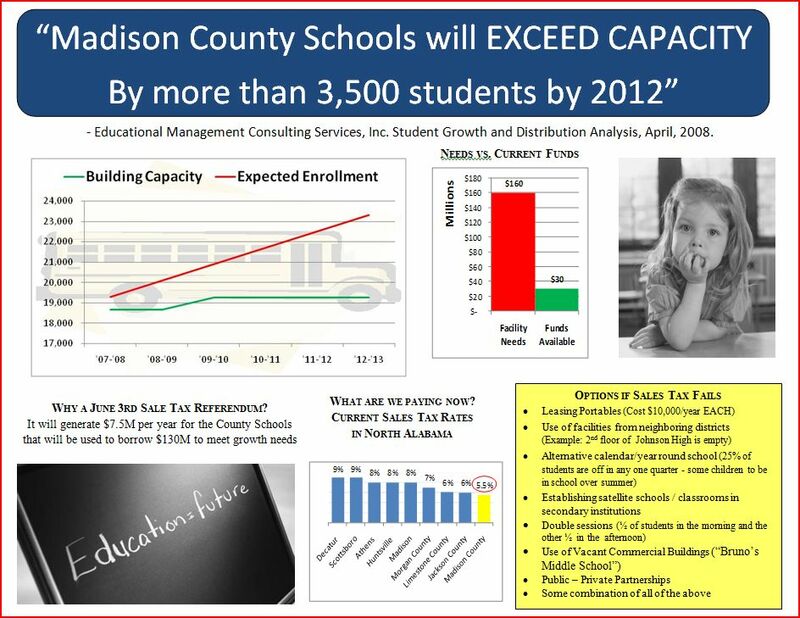 This tax vote is critical to the future of education in the Madison County School System. WE SIMPLY HAVE TO HAVE ADEQUATE FACILITIES TO HOUSE THE TREMENDOUS INFLUX OF STUDENTS WE ARE CONTINUING TO FACE. Don’t hesitate to contact me if I can be of any assistance to you. If you are a school system employee, do NOT use your school system e-mail account to forward these messages. Please do so via your personal e-mail account. Renaissance, Bethel's upbeat, entertaining "performance troupe" uses choirs, ensembles and soloists to showcase the talents of Bethel student. Renaissance, referred to as the Bethel College Performing Arts Experience, encompasses vocal talent, instrumental talent and dramatic talent to thrill audiences near and far. "Serious music, sizzling performance" sets the tone for this exciting collection of more than 100 talented students. The group performs a wide range of musical styles - bluegrass to jazz, show tunes to "doo-wop" and the best loved songs of faith - traditional and contemporary. Renaissance is an extension of Bethel's Development Office and builds on our already rich performance tradition to extend the reputation and the reach of the college. From stages, platforms, and pulpits - large and small - Renaissance shows the world that Bethel College, and her students, are among the best in the nation. Renaissance Director Peter Jeffrey won a 1995 GMA Dove Award for his song "Without You (I Haven't Got a Prayer)." That same song also earned the 1995 CCMA Song of the Year. Peter has also worked with some of the music industry's most prominent entertainers including Doug Stone, McBride and the Ride, JoDee Messina and Lee Ann Womack, and he has performed in several music videos and appeared on such television shows as "The Tonight Show," "The Today Show," and "The View." He has extensive live show experience and has even entertained from the stage of the "Grand Ole Opry," as well as from stages all over the world. Peter draws from his many years of performing to encourage and drive Renaissance to new levels of excitement -- so contagious that the performing troupe has literally brought every audience to its feet, without exception! Peter's knowledge of and familiarity with many different styles of music have provided him -- and Renaissance -- with virtually unlimited possibilities. I would like to invite you and your family to come out to Gurley Lodges 1st annual OLE TIME AUCTION. Gurley Lodge is accepting any type of donation or service to be auctioned off. Proceeds go to benefit the historic Gurley Lodge # 521 F & AM. Gurley Lodge has been an active fraternity of good quality men in the Town of Gurley and the surrounding community for over 100 yrs. With your help and support we will ensure that the lodge will continue to prosper and be successful. This will be a fun event to participate or come out and watch with your family. We will be offering a variety of concessions for your convenience. For more information feel free to contact me or go online to our website www.gurleylodge521.org . I am writing to express my concerns about the proposed legislation to add more required PE time to our public school days. I fear that adding this requirement will make it even harder for our students to have time for their academic efforts and also take advantage of worthwhile electives. My child is a member of the band and I believe that activity is also healthy, wholesome, and educational. Band offers opportunities that can’t be substituted by additional PE time and I want my child to be able to enjoy those benefits. I am therefore urging you to please work to defeat House Bill 83 when it come to a vote. I want to again urge you to work with me to alert our directors of the impending vote on House Bill 83. The Alabama State Assoc. for Health, PE, Recreation and Dance (ASAHPERD) is sending flyers to all our legislators this week asking for their support. If this bill is passed, it would mandate that every high school student have 45 minutes of PE every day. This would drastically alter all school scheduling and almost eliminate many electives, academies, block scheduling, etc. and replace them with PE. Many students will be changing their course selections and dropping an elective NEXT YEAR….will it be band? I don’t want to be an alarmist about this…. but this is not going away and must be addressed. You must take immediate action to defeat this bill! Please ask everyone to contact their Representative. They may send an email to house3@alhouse.org with the intended recipient’s name in the subject line, or send a fax to 334-353-0828. To contact your Senator, send an email to senate.billstatus@alsenate.org with the intended recipient’s name in the subject line, or send a fax to 334-242-8819. Century Celebration Parade in Gurley (Rain or Shine). The parade will form behind the old school. It will be followed by a brief reenactment of the Governor’s dedication of the high school. Weather permitting, this will be on the football field behind the school. In case of rain the ceremony will be in the auditorium. Century Celebration Banquet, VBC, East Hall 2. I am in the process of researching a highway that ran through Gurley beginning in 1919. It was called the Dixie Lee Highway and ran from Kimball, TN through north Alabama and on to Memphis, TN. From Paint Rock, it crossed the railroad tracks where Jackson County Rd 65 and 72 meet, then it ran parallel to the tracks, on the north side of the tracks, toward Gurley. If you look between the county line and co rd 65, you can still see the power line poles that were erected alongside this road. The road would have been between the powerlines and the train tracks. This highway is now just a dirt farm road in this area but in other areas of Jackson County, it is still being used. The Dixie Lee Highway was replaced in the 1930's with Robert E. Lee Highway/72. The road came into Gurley onto what is now Railroad Street and then crossed the tracks on Section Line Road and continued on Little Cove Road on its way to join Old 431 in Big Cove and on into Huntsville. If you travel east on Railroad Street today until the pavement ends, you can see a culvert built for this highway. I am still researching this and just wanted to share with you. If you have any other information on this, please feel free to let me know!